The 83rd annual Academy Awards will be broadcasted this coming Sunday. So, I should have been going to the theater to watch one of the films up for Best Picture like Black Swan or The King’s Speech. Instead, I went to Justin Bieber: Never Say Never. I had heard really good reviews of the film, and because I know the team at Give Back Brands (the company behind Justin Bieber’s upcoming fragrance launch), I somewhat have Bieber fever and really think this kid is ridiculously talented. Plus, I just wanted to watch a film that was fun, lighthearted, and inspiring. And inspiring it is! 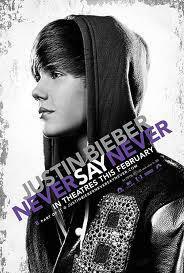 Never Say Never chronicles Bieber’s rise to stardom and director Jon M. Chu does a great job of splicing his baby home videos (and you can see that he was gifted even then), with the YouTube videos, and his discovery by his agent Scooter Braun, as well as the footage of his team, family, behind-the-scenes hard work and preparation, and of course, concert video. The movie culminates at a sold-out Madison Square Garden concert, the grail and barometer of an artist’s popularity and success, which, by the way, Justin sold out in a mere 22 minutes. I found it a fascinating peek into Bieber’s star-making process, and it is clear that Justin Bieber is a prodigious talent. Justin most definitely has that brazenness that I desire. That, coupled with the fact that he is adorably cute (the slo-mo hair clip is downright hilarious), and amazingly talented with his singing and ease around multiple musical instruments (drums, guitar and piano), plus slick dancing moves. Moreover, he is clearly just an all-around likeable and good kid.